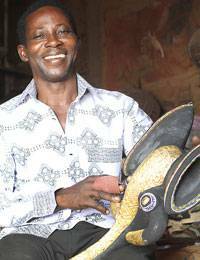 Victor Yao Delanyo celebrates the art of the Ewe people of Ghana with an assortment of hand-carved sese wood masks. Two feature embossed brass plates to resemble tribal scarifications, and two are painted by hand. The ornaments hang from leather hoops.